Emily lost a tooth last week. She came upstairs to show us the bloody gap in her mouth and announced, "I pulled out my tooth! It felt like I got shot in the face, but I didn't even even cry a bit!" Of course, the extracted tooth meant a visit from the Tooth Fairy. Apparently during the night she met Eddie, our Elf on the Shelf, and left quite an impression. Emily woke to find not only her tooth gone, but also Eddie holding a heart-shaped sign he'd made with a marriage proposal. Within 24 hours, however, Eddie had broken off his engagement. The next morning we found him sitting next to a box that had shipped from the North Pole and been stamped in countries all over the world. The box had a note on top that read: "Dear Emily and Kendall, I think Eddie needs some help. Love, Santa." Eddie was holding a note of his own that read simply: "Dear Tooth Fairy, I changed my mind." Upon opening the box, it became clear what prompted Eddie's fickle heart to break off his brief romance. Inside was a new Elf on the Shelf, and this one was a girl! After much deliberation over names (suggestions included Betty, Elf-vira, Mistletoe, and Catherine [like cousin Eddie's spouse in the "Vacation" movies]), we settled on Holly. With a new girl elf in the house, Emily and Kendall set about making her feel welcome. They got some shoe boxes out of the garage and constructed a play house for our elves using doll furniture. The next morning they were very pleased to find Eddie and Holly sitting in the chairs they'd set up, but the elves had also extracted an array of desserts from the fridge and added them to the table. At first it seemed that Holly might help keep Eddie in line. If he was looking to impress her, he'd be on his best behavior, right? The next day though, that theory was proven wrong as we came downstairs to find our Christmas tree looking like the Toomer's Oaks after an Auburn victory (well, maybe not that dramatic). The toilet paper trailed off from the tree, leading down the hall and into the bathroom, where it was still connected to the roll on the wall. And sitting there grinning together were Holly and Eddie. So the question is now: Is Eddie a bad influence on Holly, or is she just as mischievous as he? And what would the Tooth Fairy think of all this? I couldn't bring myself to eat breakfast today, I was still so full of pie from last night's Christmas party for the church office. There were at least six varieties, and our hosts Rick and Lisa encouraged us to sample them all. I won't disclose how many pieces I ate, but I will say that despite the temptation, I was unable to fit them all in. 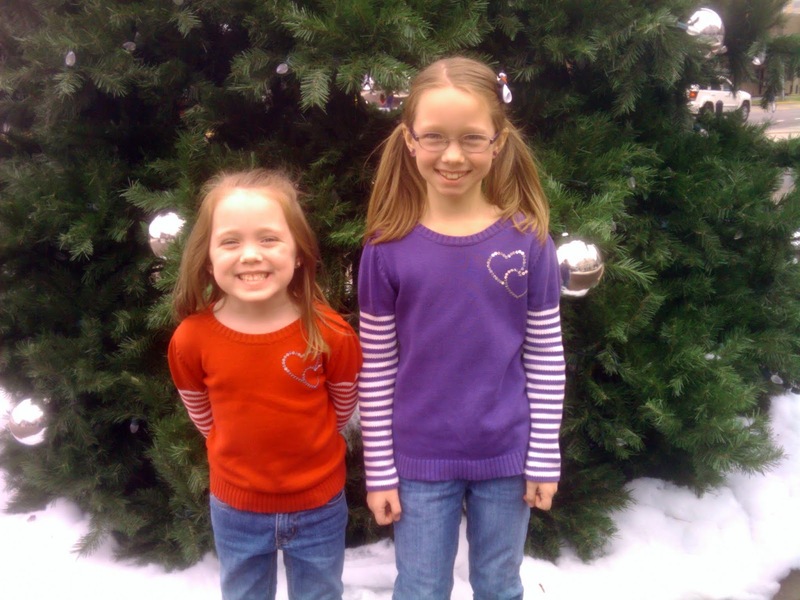 While Misty and her mom went out grocery shopping today, I took the girls out to run a few errands of our own. We had lunch in SoHo Square, and Emily and Kendall insisted on posing for a photo in front of the huge Christmas tree there. After lunch, we spent a couple hours at McWane Science Center, where the third floor was decked out with their "Winter Wonderland" theme. The girls played in the artificial snow (which was even cold), rode a miniature train, looked at the model train exhibits (we particularly liked the Hogwarts Castle set), and slid down the giant slide decorated with white Christmas lights. When we finally returned home, we only had a few minutes before heading right back out again -- this time to see Santa. 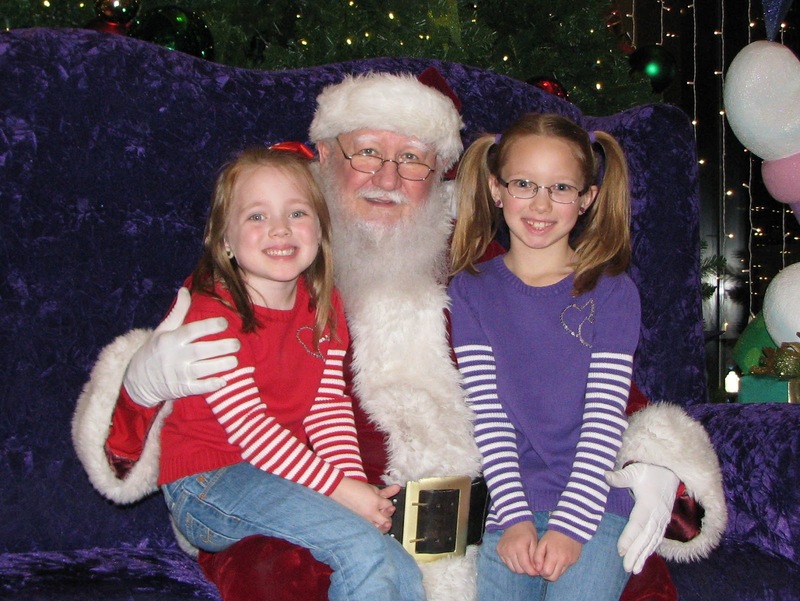 As is our tradition, we visited Santa at Colonial Brookwood Village mall. We've never had to endure a long line there, the setup is nice, and almost every year we see the same guy (which helps reaffirm the magic). Plus, the line lets out right by the See's Candy kiosk where they give out free chocolate samples. As we drove home, we avoided the highway, instead detouring through neighborhoods to see the Christmas lights. By that time though, the girls were starting to crack from a full day of holiday stimulation, and they entered their silliness mode that snowballs into absurdity. Sometimes it doesn't matter if Santa is watching or the Elf on the Shelf is keeping notes -- they've just gotta blow off steam and act like a couple of Tasmanian devils who've been knocking back Pixy Stix. Greenwood Elementary's holiday program was last night. Kendall and her kindergarten classmates, in matching shirts painted with reindeer made from hand prints, sang "Hanukkah is Here" and "Rudolph, the Red-Nosed Reindeer." To help alleviate overcrowding in the gym and cut down on time, the holiday music event now includes only kindergarten through second grade (with the exception of the "Gator Sounds" Choir), so Emily sat with us in the audience this year. I was surprised by how excited Kendall seemed during the event. In the days leading up to it, we'd tried to talk to her about it, but she'd repeatedly act like she wasn't interested. Even right before we left the house last night, when Misty requested a preview performance Kendall was very hesitant. She only agreed to sing for us with Emily's help, and even then she acted shy and reserved. Once we got to the school though, her demeanor changed. She showed no stage fright at all, and was just happy to be around her friends. She even smiled while looking at the camera -- an act that's usually nearly impossible to coax out of her. We're proud of Kendall's performance and very pleased that she had fun. As today is December 12, our elf's visit is at the halfway point (he travels back to the North Pole with Santa on Christmas eve). So far, Eddie's adventures have included dumping out one of my Christmas Lego sets, drinking maple syrup, getting stuck in the ceiling fan, turning Misty's car around backwards in the garage, reading his "Elf on the Shelf" book to a group of toys, and making himself an elf-sized serving of cookies and milk. Here's the photo gallery chronicling his activity. Today, Eddie brought the girls a note from Santa encouraging them to continue to be good and warning of Eddie's mischievous nature. Santa has a valid point. Yesterday was probably Eddie's most elaborate prank yet, when he used yarn to create a system of elf zip lines through the kitchen, effectively tying up the cabinets, the chairs, and the refrigerator door. The girls were very impressed, as they seem to derive more enjoyment from the more mess Eddie makes. Also, the yarn made for a fun obstacle course in navigating the kitchen. What will Eddie do next? Only time will tell. Kendall has been sick a lot lately. She had strep throat, and after she finished her medicine she stayed well for a week, then got strep again. When she recovered from her second bout of strep, she got her FluMist vaccine and wound up with a few days of flu symptoms. Then this week she had a couple days of fever, keeping her home from school again. All of this illness has come with congestion and a runny nose. But Kendall refuses to blow her nose. She insists she can't and snorts her snot back up into her sinuses instead. Misty and I keep trying to explain that her body is trying to get rid of the snot, and that she needs to blow it out or she'll continue to feel sick. We've explained that wiping her runny nose instead of blowing is only making it red and sore. Kendall is not interested in our advice, though. She prefers to wipe and snort. Last night as we pleaded with her to at least try to blow her nose, she exclaimed, "It's not the snot that's making me sick! It's because one time at school I was eating a cupcake, and I accidentally ate a little piece of the wrapper! That's why I keep being sick so much!" After she passed gas at the dinner table: "Wow. That sounded like a motor." To Misty: "Something smells like a ham sandwich that's been cooked in a dirty garbage can. It's either your perfume or my armpit." To me: "Daddy, that shirt makes you look pregnant." This may appear to be an ordinary dinner, but that's hardly the case. What's special here is that Emily made the whole thing! There's Salisbury steak, rice, broccoli, field peas, and rolls. Misty insists that her own contributions were extremely minimal (such as turning on the burners) and keeps saying how proud she is of our little 8-year-old girl. As Emily plated the food for us with a big smile on her face, you could tell she was proud, too. And she should be -- because everything was really good. It's been a pleasantly warm weekend, so today we headed outdoors to walk around the Birmingham Botanical Gardens. Even though there isn't a whole lot in bloom right now, it's always a pretty place to visit. Our Elf on the Shelf returned this morning. And thank goodness, because the girls have been driving me crazy mentioning his absence every five minutes as if the repetition would somehow make him materialize. Emily had even begun incorporating our elf into prayers: "God, please let Eddie come tonight." Apparently, some kids at school have been talking about their elves, who showed up just after Thanksgiving, and Emily and Kendall are eager to be part of the fun. They even did some detective work, pulling out the Elf on the Shelf book and examining Eddie's original arrival certificate which noted that he first showed up November 30. Of course, last year didn't make his appearance until December 1, and it looks like that tradition is holding. Now that Eddie is here, the girls are very concerned with what he's up to. He tends to get into mischief, but usually doesn't make too much mess. Today we found him atop the upstairs Christmas tree, watching the girls as they slept in the playroom. I'll be taking pictures of his adventures each day. Unfortunately, Eddie's presence has not inspired the girls to curb their arguing with one another. Even with him sitting on his usual perch in the kitchen, they'll keep bickering right below him without regard for his nightly reports to Santa back at the North Pole.